Last week saw the opening of the new Air Traffic Control [ ATC ] opened at the National Museum of Computing [ TNMoC ]. Sponsored by NATS. The exhibit shows the advances, not only in technology, but also how you can explain the way that computers and keeping our skies safe for many decades. The centre-piece of the gallery is a high-fidelity Air Traffic Control Simulator that gives visitors a real sense of what it is like to be an air traffic controller at a NATS control centre or major airport today. In replay mode, visitors can observe aircraft movements on a panoramic three-screen virtual airport or a Control Centre radar display and listen to radio transmits between the controllers and pilots. 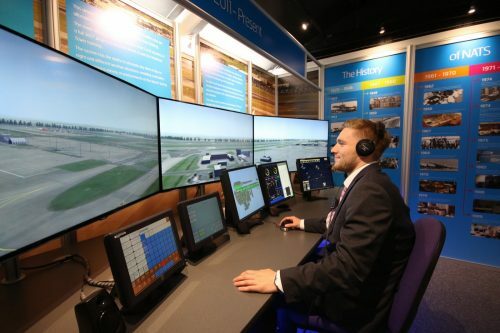 In interactive mode, visitors can take up position at the simulators and experience, hands-on, being a controller while a member of the museum team acts as a pilot, flying the simulated aircraft in response to commands from the visitors. The gallery also features an historic green-screen, round IRIS radar display (an investigative radar recording system) with working 1970’s PDP-11 hardware that has been restored to working order by TNMoC volunteers. This eye-catching console and screen operated behind closed doors at NATS Control Centre in West Drayton for 25 years until it was decommissioned in 2008. Find out more about TNMoC and the ATC gallery at the official website as well as opening times and prices.